Last week was Independence Day, one of my favorite times of the year. This is always a time of lots of celebration around my home town. In the days leading up, there is an annual parade and rodeo that we never miss, and then on the actual 4th we hold a pool party with family and friends at our home. The one disappointment this year was the absence of fireworks. You probably heard about all the wildfires burning around the country this July. Well, we happen to live in one of the danger zones. The county did remove the ban on fireworks for the day of the 4th but we opted to not do any since we live in the country, surrounded by dry fields. 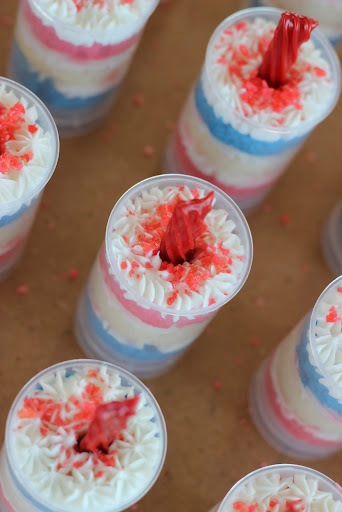 Being the resourceful foodie that I am, I decided to incorporate fireworks and explosions into my dessert instead. If we can’t light fireworks, then let’s eat them! So, where do you go to find something that can safely explode in your mouth? The candy isle, of course. 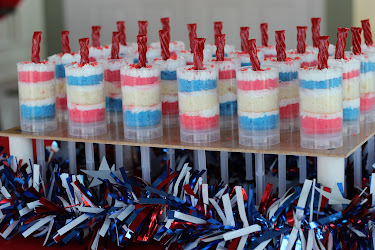 One of my all-time favorite childhood candies seemed just perfect for the 4th of July; Pop Rocks . 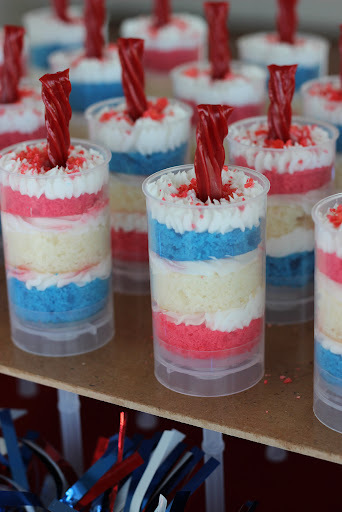 Here are my version of 4th of July fireworks that taste wonderful, look festive and explode in your mouth. Before I begin, I have to confess that these didn’t turn out quite like I had hoped and I will do them a little differently next time so I’ll explain what went wrong as we go along. To make these bang up desserts you will need, in addition to a white cake mix and icing, Twizzlers and Pop Rocks . I used three bags of Pop Rocks for 24 push-ups. 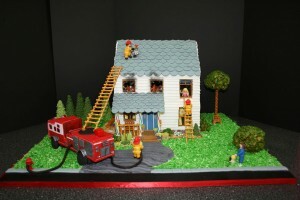 If you aren’t familiar with cake push-ups and want some more information on the basics of making them, click here to read a past blog entry on cake push-ups. 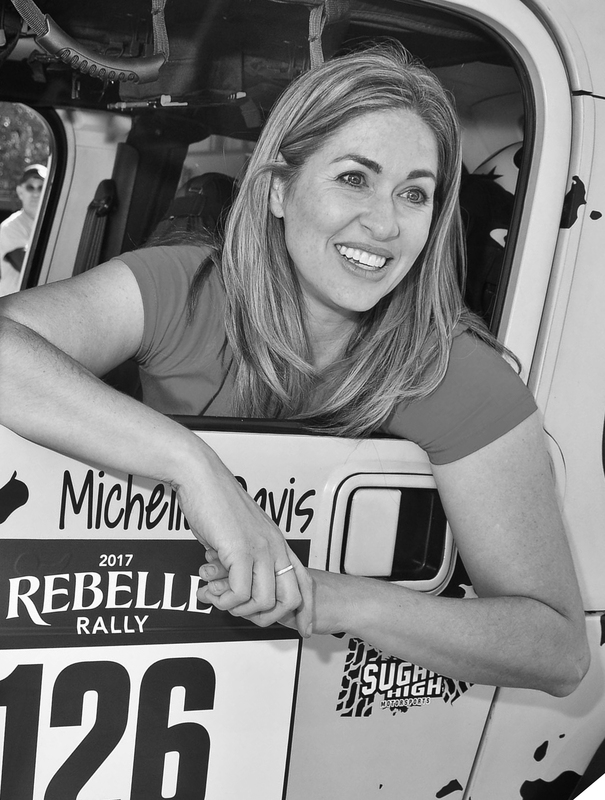 Take your favorite white cake batter recipe or mix and divide the prepared batter into thirds before baking. 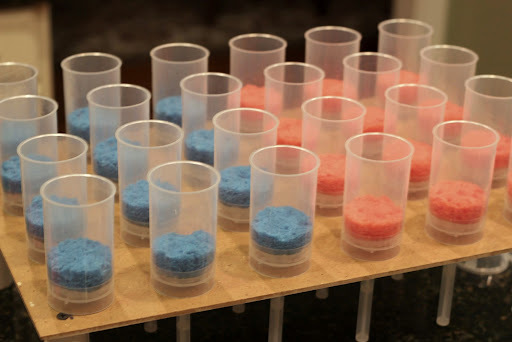 Use paste colors to add red to one third and blue to another. 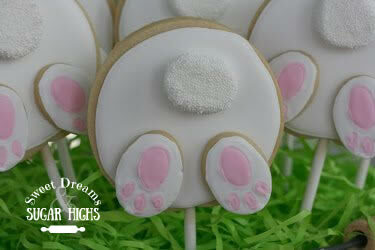 Pour them into similar sized cake pans and bake. 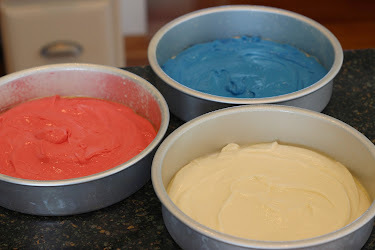 I found that the cakes that were colored took a little longer to bake than the regular one. Oh, and one more tip, be sure to use No Taste Red so that you don’t get the bitter taste that is common with red food coloring. Here are the cakes before they went in the oven. Don’t they look so pretty? It would be fun to make a layered cake using the three colored cakes. 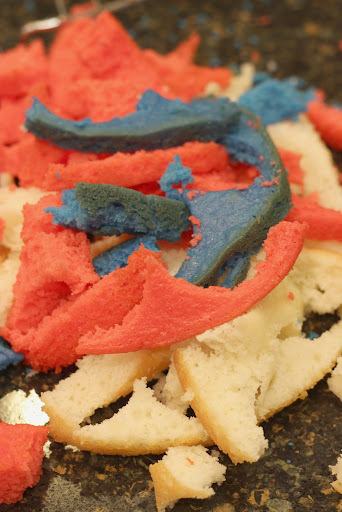 I also liked how the cake scraps looked when they were all piled together on my counter later on. 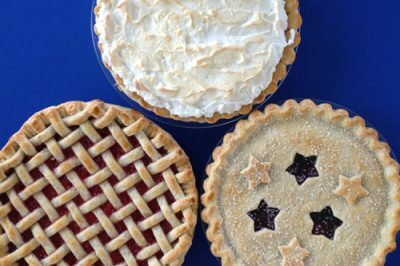 Cut your cakes to an even thickness and then use a round cutter to cut out cake circles. (Click here for more information on this.) Place the circles at the bottom of the push-up containers. My husband made me this cool stand that the push-ups are setting in but you can also purchase one or push them into styrofoam. Next, add a layer of icing. I used buttercream icing and a decorating bag with a tip #18 . Now here is where I messed up. On top of the icing I placed a layer of Pop Rocks. Unfortunately, I forgot that when Pop Rocks touch moisture of any kind they explode. I could hear them exploding as soon as they touched the moist icing and especially after I layered another cake on top of them. They ended up liquifying between the layers. Next time I will not bother placing them between the layers and will only put them on top of the finished push-ups. After the first layer, I added a piece of white cake and some more icing. 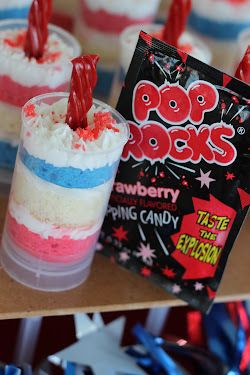 I also added another layer of Pop Rocks but like I just said, don’t do that. I finished with another piece of colored cake and a final layer of icing. With this layer of icing I used the tip # 18 to make stars covering the top of the cake. 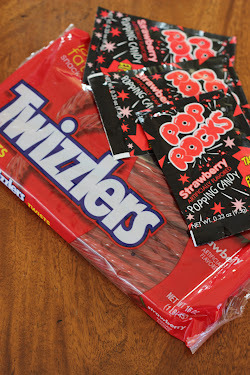 To give the look of a firecracker, I cut Twizzlers into thirds and inserted them for the fuse. 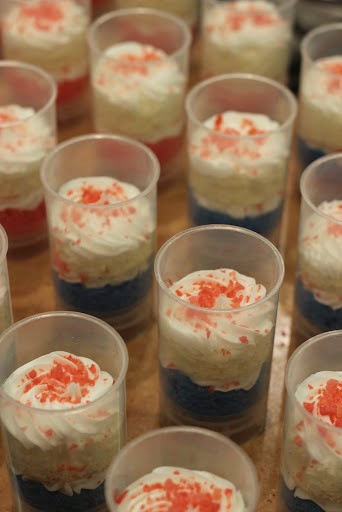 I then topped them with a final layer of Pop Rocks. 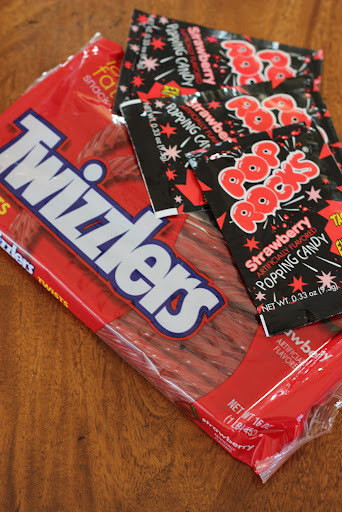 In the future this will be my only layer of the Pop Rocks. 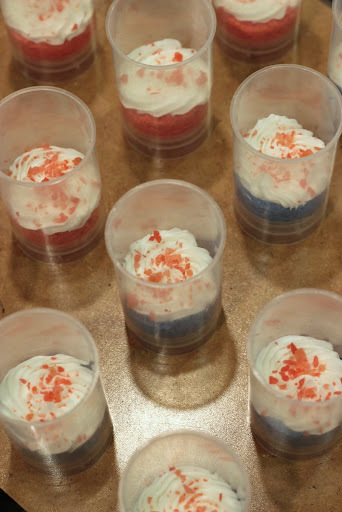 I will also wait until the icing has dried before adding the Pop Rocks so that everyone will be sure to get the explosion in their mouths as they eat instead of the moisture causing them to explode prematurely. Despite my mistakes, they were still a very yummy treat and a big hit at my party. Great idea. I bet they were yummy! If I’m making these 2 days in advance (it’s my only time to do so) should they go in the fridge or stay out? Hi Julianne, I am so sorry but I am just now seeing this. I haven’t been on my computer the last week due to the holiday. I am guessing you already made these so my response is no longer needed but I would refrigerate them then let them come to room temperature before eating. Also I wouldn’t put the Poprocks on till right before serving because they will start to melt from the moisture in the icing. Hope they turned out well for you.